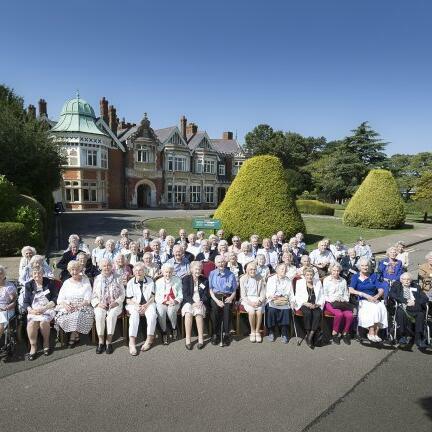 Every year, close to the anniversary of GC&CS staff first arriving at Bletchley Park in 1939 we invite our Veterans and their families back to celebrate their vital war work. It’s our favourite day of the year at the Museum and it allows us to share their amazing stories with our listeners. This year also coincides with the 80th anniversary of the formation of the Auxiliary Territorial Service or ATS, the woman’s branch of the British Army during World War 2. To celebrate, our Veterans were given a sneak peek at our new ATS pop-up exhibition. In this, the first of two episodes this month, we will take you to this year’s reunion and listen in as Betty Webb and Mary Watkins reminisce about their time in the ATS, the gas masks, the knickers and how it changed both their lives. Also we hear from Doris Moss, who arrived at Bletchley in 1942 after escaping the German advance in Belgium two years earlier and went on to break both Italian & Japanese codes. Finally actress and drama teacher Elizabeth Davies tells us how she was plucked from Balliol College Oxford to help crack Japanese Naval Codes.